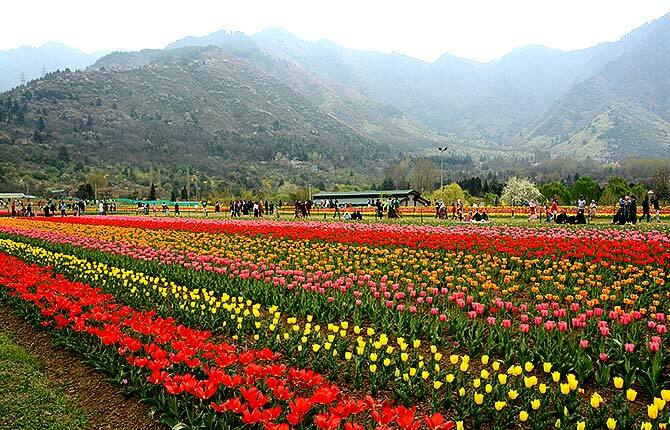 A treat for eyes and the soul -- that is the tulip festival in Srinagar! 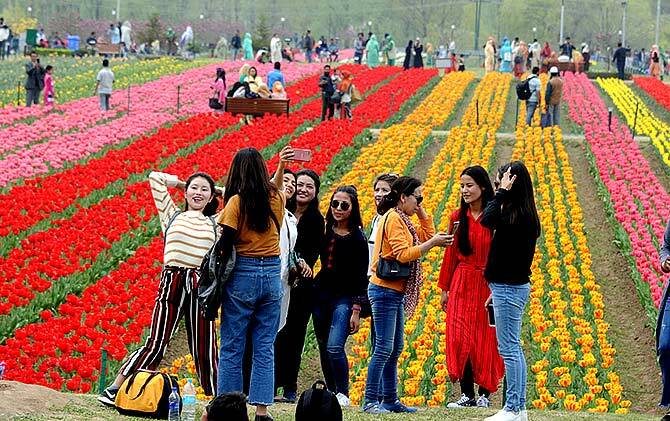 Tourists have been flocking the famous tulip garden in Jammu and Kashmir's Srinagar ever since it opened for visitors last Sunday. 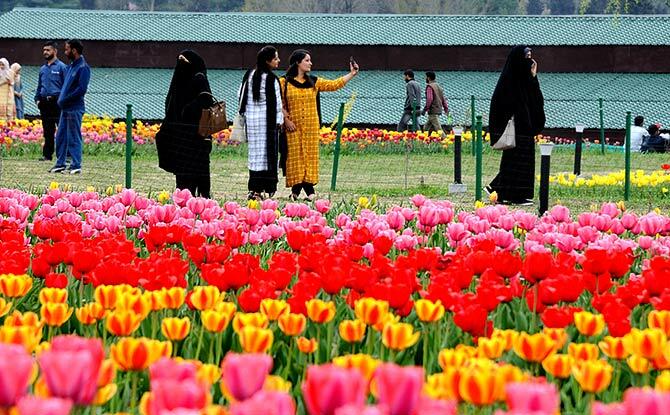 Rediff.com's Umar Ganie took a walk in the stunning garden and captured the garden in all its wonder. 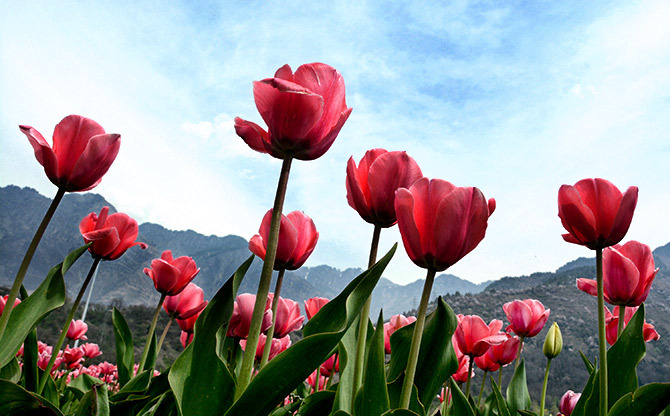 The garden is situated in the mesmerising foothills of the Zabarwan hills on the banks of the Dal Lake. As far as your eyes can wander, all you will be able to see is a montage of colourful flowers. 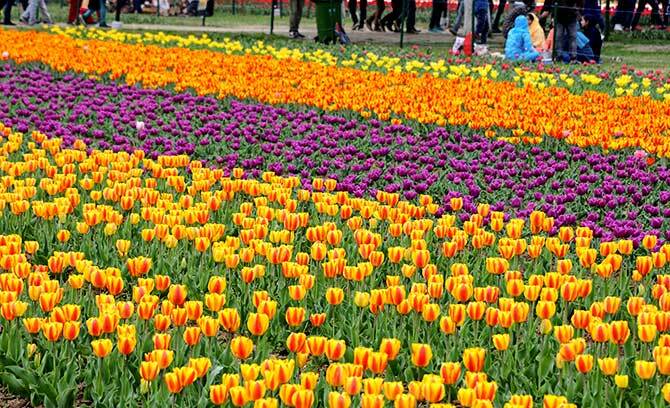 The garden, known as Asia's largest tulip garden, has over 12 lakh tulips of 51 varieties, all in full bloom these days. 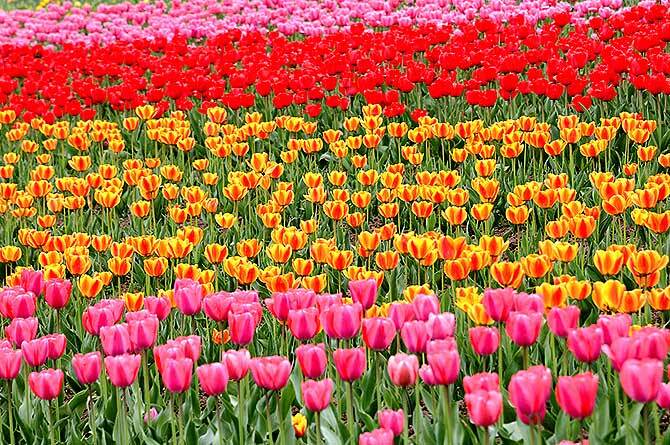 Think of any colour -- red, yellow, purple -- and tulips in those colours are present at the garden. Not just red, purple, orange, yellow and lilac, but the garden is home to several hybrid flowers too. The brilliant colours will surely dazzle your senses. The flowers have distinct shapes from turban-like hemispheres to elongated to scattered petals to upward flowing petals to sepals that look like exploding fires. Every hybrid variety has its own flower bed, which is 1 metre wide and 80 metre long. 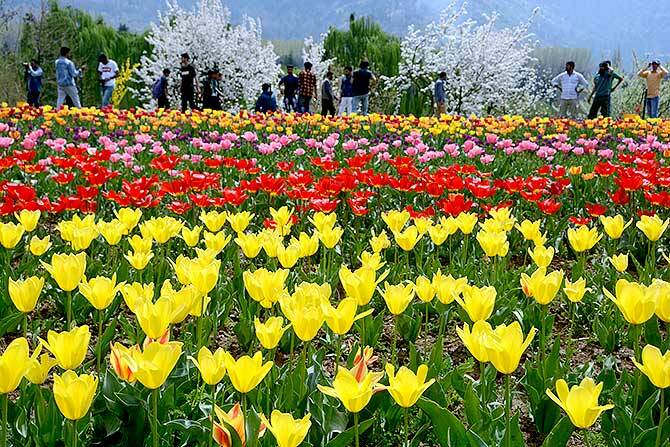 The Tulip Festival is held at the beginning of spring in Srinagar, between March and April, when the tulip buds are ready to unfurl. 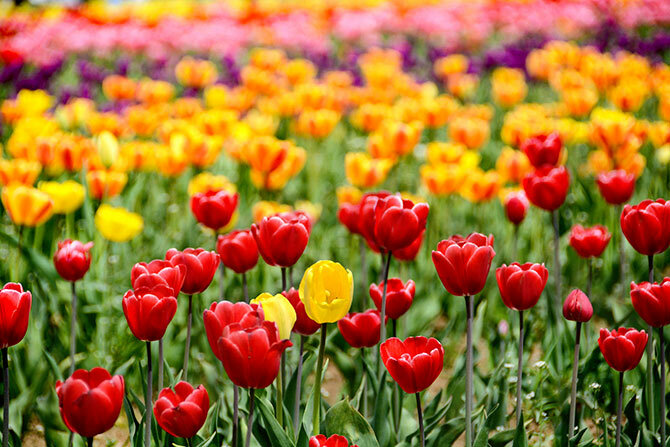 This festival lasts for fifteen days as different flowers continue to bloom creating a rainbow of colours. Spread over 30 acres, this terraced garden is built on a mountain slope and houses flowers of other varieties like daffodils, hyacinths and ranunculus. 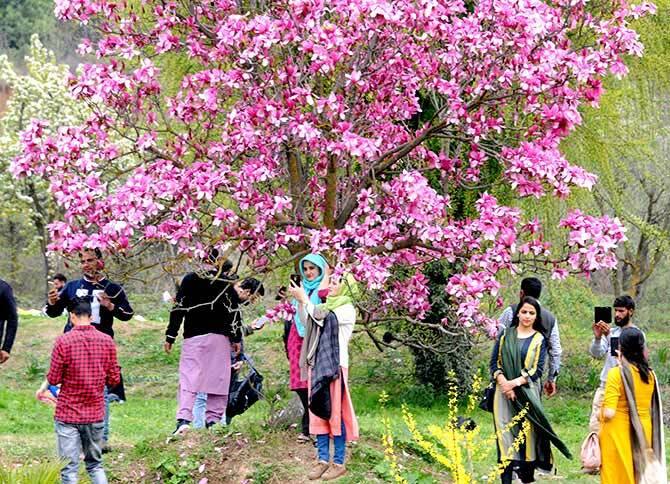 Over 3,000 people, mostly locals and some tourists, visited the garden on its first day. 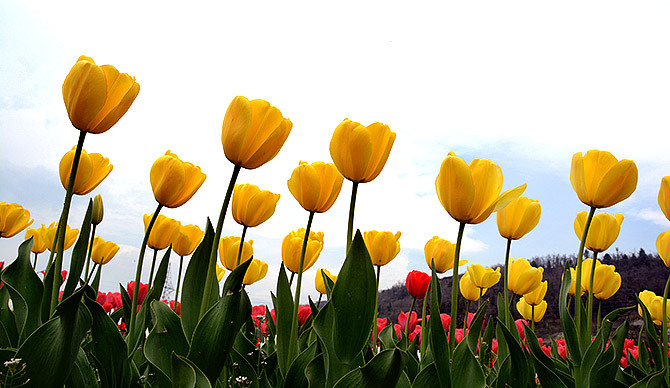 The different coloured tulips attract people from not only India, but even abroad. 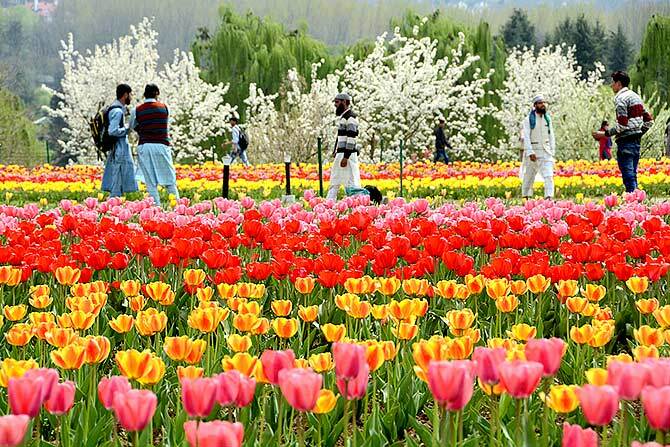 For those who don't know, this flower field was the first largest landscaping project undertaken by the government after the Mughals built pleasure spots in Kashmir in the 16th century. 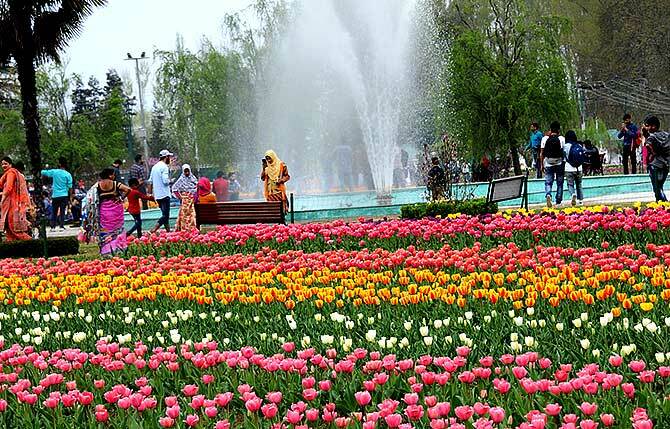 Jammu and Kashmir governor’s advisor Khurshid Ahmed Ganai, who is also advisor in-charge of the floriculture and tourism departments, complimented the floriculture department for throwing open the tulip garden for public viewing, an official spokesman said in a statement. Entry for this beautiful landscape is only Rs 50 for adults. 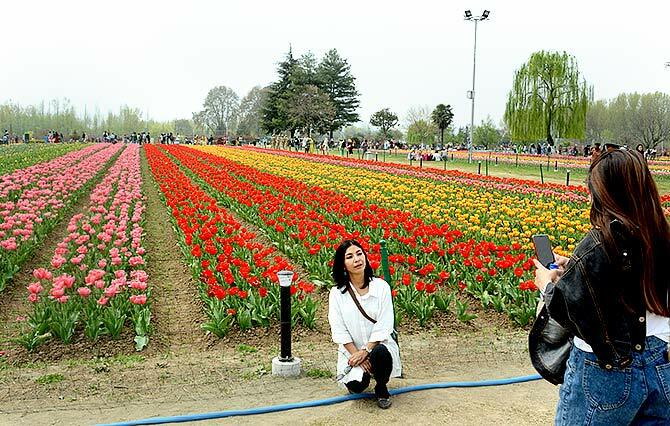 The tulip garden has attracted many Bollywood film makers to shoot here. It was opened in 2008 by then chief minister Ghulam Nabi Azad.